There are many advantages to having or giving a Travel Gift Card. Give a Card For the people who make your life special and fun, there are times when you can return special times in the form a Gift Card. Whether it be a Birthday, Graduation, Anniversary, Wedding, Retirement or just because. A Gift Card will allow the freedom of selecting the best vacation when the appropriate time nears. 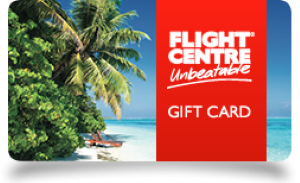 There is just so much you can do with a Flight Centre Canada Gift Card.